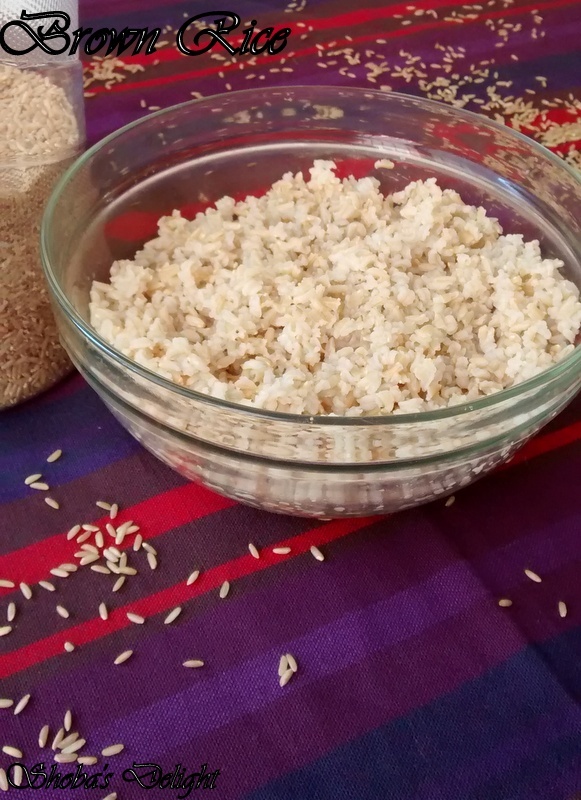 Brown rice is a less-processed form of rice family. Significantly it reduces the cooking time by using a pressure cooker. 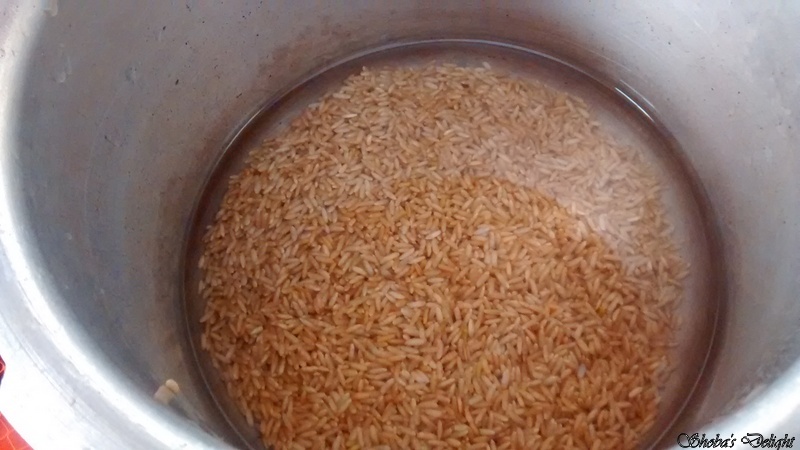 Cooking brown rice takes a little more time than cooking ordinary white rice and you'll need slightly more liquid. 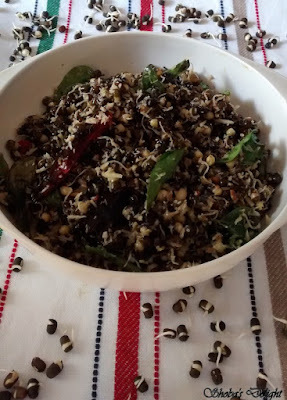 Brown rice is a nutritional rock star in the rice so I have to tell you that more times than not, I am unhappy with the texture when I cook it at home. 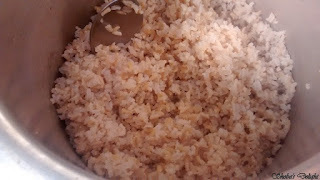 I have no problem turning out batches of perfectly steamed white rice, whether it’s on the stovetop, in the oven, or in the rice cooker. If you are making 2 or 3 cups of rice, double or triple the recipe. 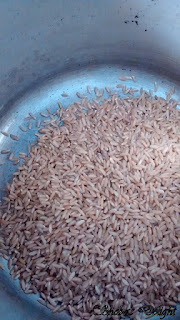 Enjoy by utilizing lots of brown rice in your daily life and lead a happier life. Sesame oil -1 tsp or Butter -1/2 tbsp. 1. If you're cooking your rice with stock instead of water, you might want to use less salt (or none at all) depending on how salty your stock is. 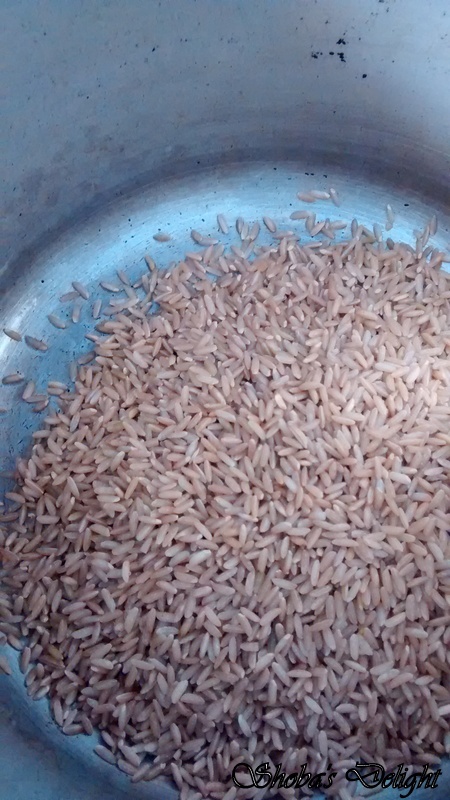 Soak the brown rice for 15 minutes. Rinse rice in a strainer under cold running water for 30 seconds, swirling the rice around with your hand. 2. 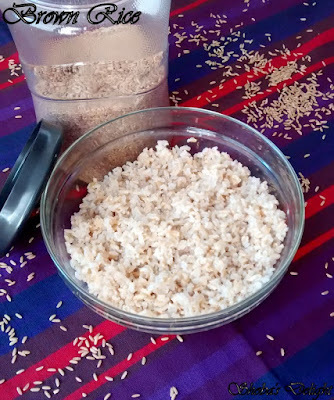 Drain the rice in strainer, then quickly return to the pressure cooker and cover tightly so the steam finishes cooking the rice.Pour 2 ¼ cups water for 1 cup uncooked long-grain brown rice along with the salt in the pressure cooker. 3. Turn off the stove after 2 whistles and Let the cooked rice sit for 10 minutes, covered, to absorb maximum moisture; then remove the lid, and fluff the grains with a fork. Wash rice, rinse, and drain. Add rice and water to very large microwave safe bowl. Microwave uncovered at 100% power for 10 minutes. Reduce power to 50%, cover the bowl, and microwave another 20 minutes. Fluff with fork and serve. Brown rice can be frozen for three months for up to 3 months. Normally, cooking brown rice on the stove top takes about 50 minutes. 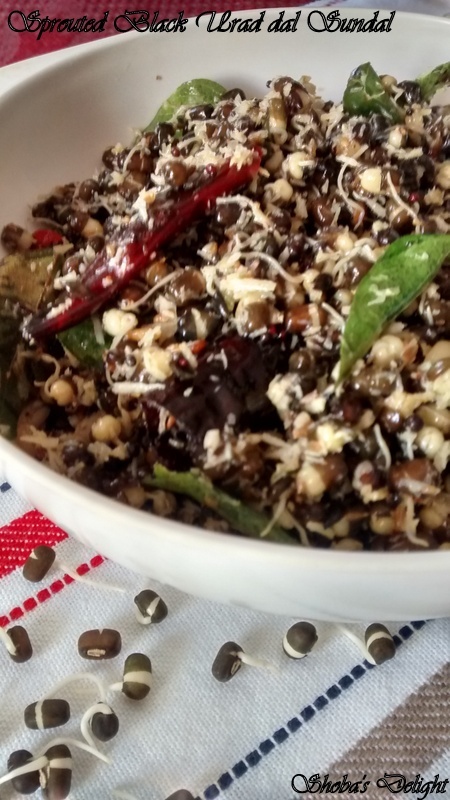 We can do it faster in the microwave – 30 minutes! Green chillies paste – 1 tbsp. Curry leaves – few sprigs. 1. Soak karupu ulundu in enough water for 6 hours. 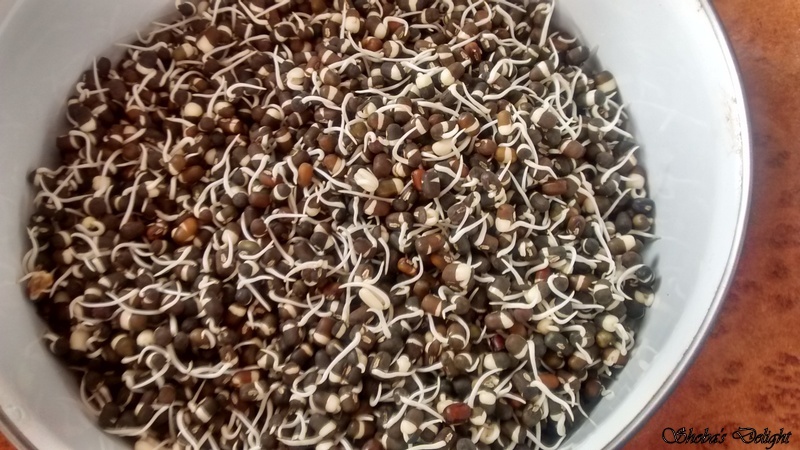 Sprout the black Grams and keep it separately. 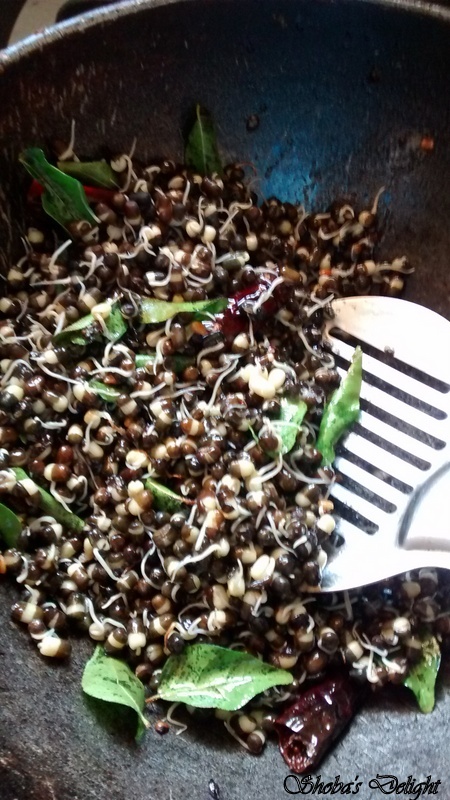 Steam the sprouted black urad dal in the idli pan for about 5 – 10 minutes and transfer it to a plate. 2. Heat 1 tbsp. of oil in a pan. When the oil is hot add mustard seeds, red chillies, hing and curry leaves. Keep stirring to avoid over frying. Add onions, green paste and fry for a few seconds. 3. 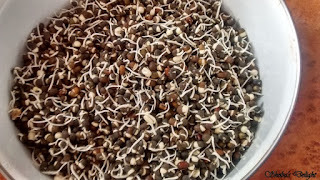 Add sprouts and stir it.Cover it and cook for 2-3 minutes on low medium or medium flame. 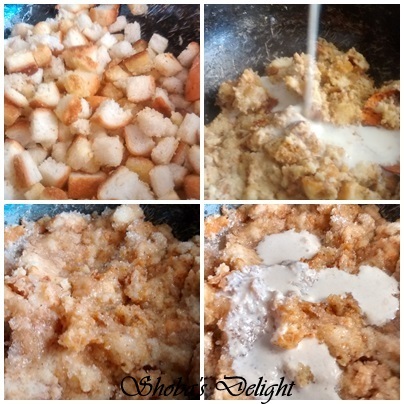 After sometime add coconut flakes and stir for 3 minutes. Turn off the stove and enjoy the healthy snack. 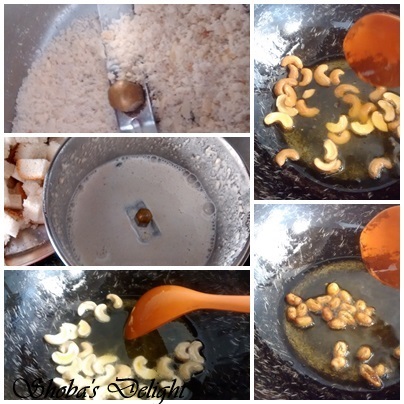 Ginger and coriander leaves can also be added. 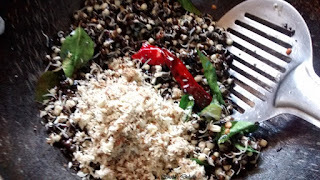 Homemade green chilli paste is a great substitute for green chillies. 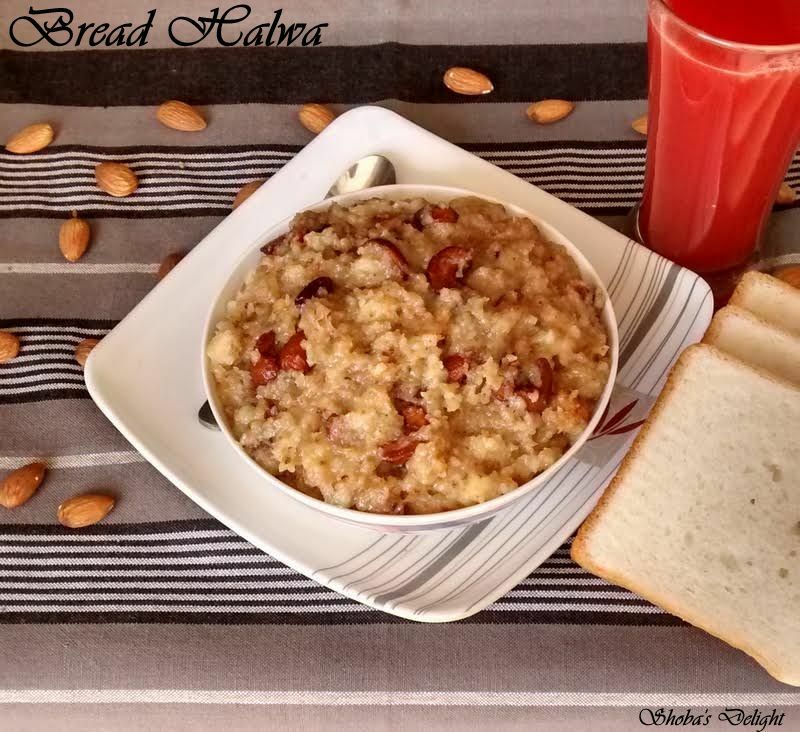 Bread Halwa can be served as an after meal dessert. Bread pieces are roasted in ghee and then cooked in milk. Finally the nuts and spices are added to make it into a rich dessert. It is very easy with simple ingredients and my kids loved it. 1. Chop the bread into small pieces. Boil milk. Set them aside. 2. Heat a table spoon of ghee is a Kadai. 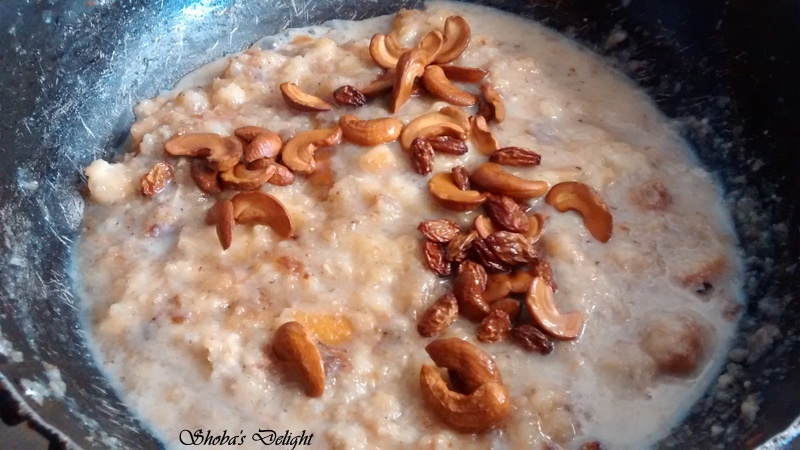 Fry the dry fruits and nuts. Keep it aside. 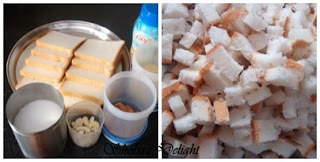 Add the chopped bread pieces with little ghee and roast them. Once it is roasted well add in the boiled milk.Add milk and sugar and mix well. With the help of ladle mash the bread pieces well. Add the cardamom powder and 2 tbsp. of ghee. 3. The halwa mixture is now in sticky consistency.Grind the Cardamom, cashew and almond with 2 tablespoon of water.Add the ground paste into the halwa mixture. 4. Cook the halwa in low flame for 15 mins.The mixture reaches the halwa consistency. 5. Bread Halwa is now ready to serve. Garnish with roasted nuts of your choice. While adding milk into the bread make sure it is hot.